There are still 2 days left when you can save an extra money at U.S. Crazy 8 store location and Crazy 8 online. Print your own coupon (available through Crazy 8 emailing) and save an extra 20% off your entire purchase! 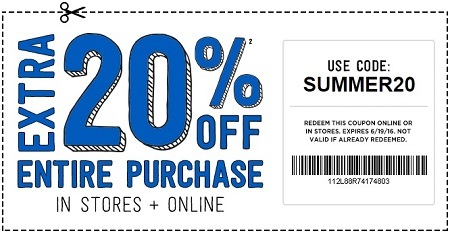 Print the coupon and redeem it at your nearest Crazy 8 store location, online use promo code SUMMER20 at checkout. Source of the information is Crazy 8. Offer is valid through June 19, 2016. For more details visit Crazy 8 store location or Crazy 8 online.